This paper proposes a multi-grid method for learning energy-based generative ConvNet models of images. For each grid, we learn an energy-based probabilistic model where the energy function is defined by a bottom-up convolutional neural network (ConvNet or CNN). Learning such a model requires generating synthesized examples from the model. 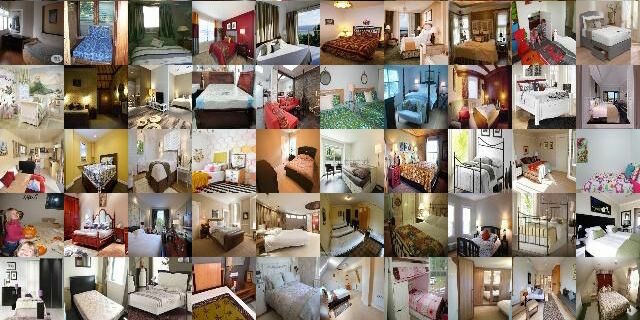 Within each iteration of our learning algorithm, for each observed training image, we generate synthesized images at multiple grids by initializing the finite-step MCMC sampling from a minimal 1 x 1 version of the training image. 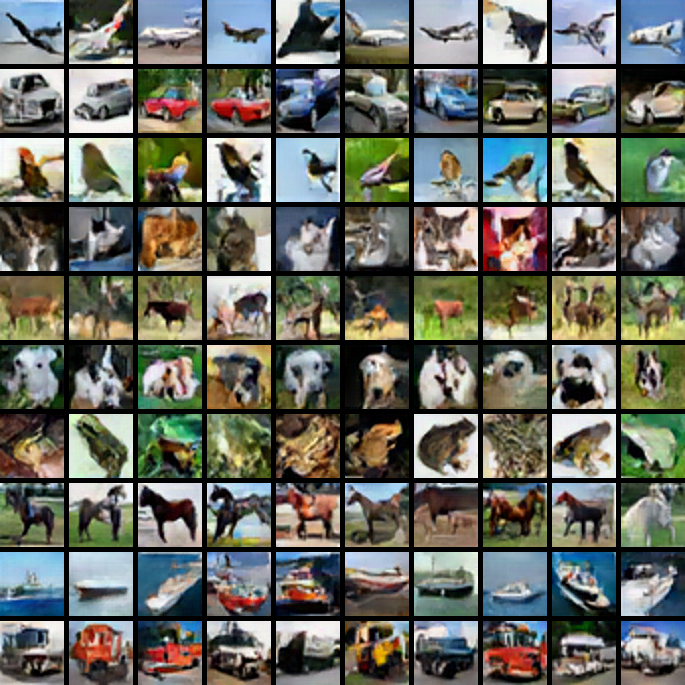 The synthesized image at each subsequent grid is obtained by a finite-step MCMC initialized from the synthesized image generated at the previous coarser grid. After obtaining the synthesized examples, the parameters of the models at multiple grids are updated separately and simultaneously based on the differences between synthesized and observed examples. We show that this multi-grid method can learn realistic energy-based generative ConvNet models, and it outperforms the original contrastive divergence (CD) and persistent CD. Figure 1. Synthesized images at multi-grids. From left to right: 4 × 4 grid, 16 × 16 grid and 64 × 64 grid. 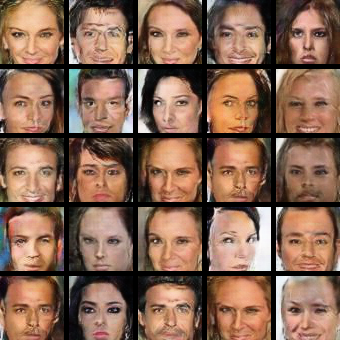 Synthesized image at each grid is obtained by 30 step Langevin sampling initialized from the synthesized image at the previous lower grid, beginning from the 1 × 1 grid. We learn multi-grid models from five datasets: CelebA, LSUN, CIFAR-10, SVHN and MIT places205. Figure 2-4 shows synthesized results learned on CelebA, LSUN and CIFAR-10. Table 1 shows quantitative evaluation of results learned on CIFAR-10. More synthesized results can be found here. Figure 2. 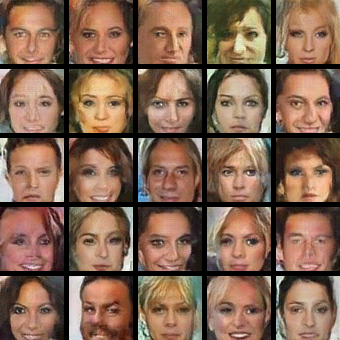 Synthesized images from models learned on the CelebA dataset. 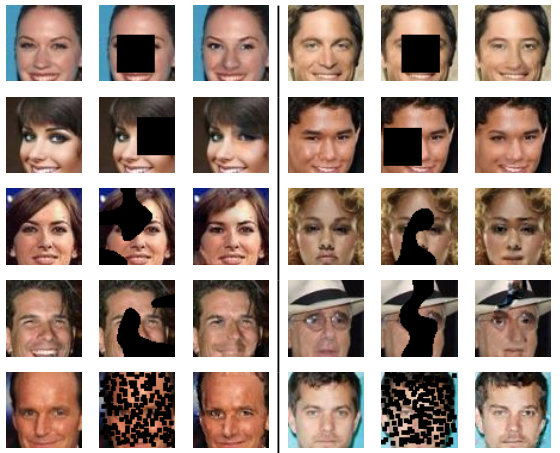 From left to right: observed images, images synthesized by DCGAN (Radford, Metz, and Chintala, 2015), single-grid method and multi-grid method. CD1 and persistent CD cannot synthesize realistic images and their results are not shown. 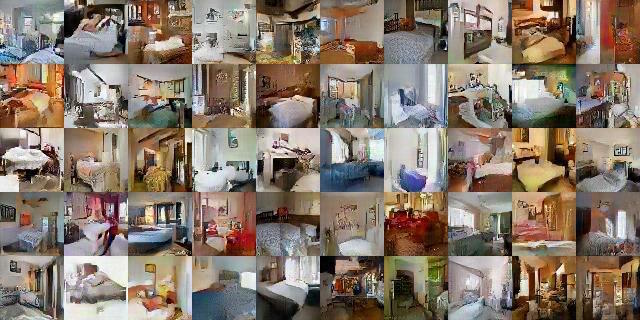 models learned from the LSUN bedrooms dataset. Figure 4. 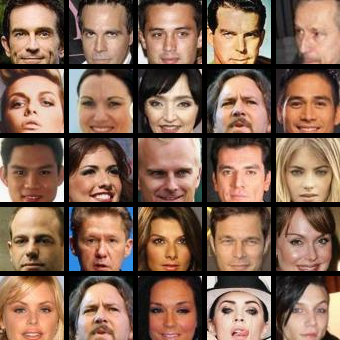 Synthesized images generated by the multi-grid models learned from the CIFAR-10 dataset. Each row illustrates a category, and the multi-grid models are learned conditional on the category. Table 1: Inception scores on CIFAR-10. To check the diversity of Langevin dynamics sampling, we synthesize images by initializing the Langevin dynamics from the same 1 x 1 image. As shown in Fig. 5, after 90 steps of Langevin dynamics, the sampled images from the same 1 x 1 image are different from each other. Figure 5. Synthesized images by initializing the Langevin dynamics sampling from the same 1× 1 image. Each block of 4 images are generated from the same 1× 1 image. To evaluate the features learned by the multi-grid method, we perform a semi-supervised classification experiment by following the same procedure outlined in (Radford, Metz, and Chintala, 2015). That is, we use the multi-grid method as a feature extractor. We first train a multi-grid model on the combination of SVHN training and testing sets in an unsupervised way. Then we extract features from learned model and train a classifier with small amount of labeled data. Table 1-2 shows classification errors using features from grid 3 to train a SVM classifier and features from all three grids to train a two-layer CNN, respectively. Table 2: Classification error of L2-SVM trained on the features learned from SVHN. Table 3: Classification error of L2-SVM trained on the features learned from SVHN. We conduct image inpainting experiments using CelebA dataset. Please check the paper for learning details. We test three different shapes of masks: 1) 32 × 32 square mask, 2) doodle mask with approximately 25% missing pixels, and 3) pepper and salt mask with approximately 60% missing pixels. Figure 6 shows the inpainting examples of the three types of masks. Table 4 shows quantitative comparison results. Figure 6. Inpainting examples on CelebA dataset for three types of masks. In each block from left to right: (1) the original image; (2) masked input; (3) inpainting image by multi-grid method. Table 4: Quantitative evaluations for three types of masks. Lower values of error are better. Higher values of PSNR are better. PCD, CD1, SG, CE and MG indicate persistent CD, one-step CD, singlegrid method, ContextEncoder and multi-grid method, respectively. We thank Zhuowen Tu for sharing his insights on his recent work on introspective learning. We thank Jianwen Xie for helpful discussions. The work is supported by DARPA SIMPLEX N66001-15-C-4035, ONR MURI N00014-16-1-2007, and DARPA ARO W911NF-16-1-0579.